Welcome to Arlington! 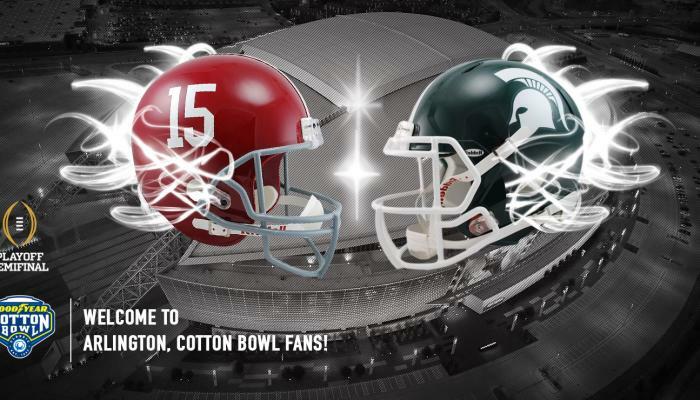 After a restful (and affordable night) sleep with a Cotton Bowl Travel package, we have plenty of fun in store for you, both before AND after the first snap of the football. Here are our suggestions and collection of things happening in and around Arlington Cotton Bowl weekend. Enjoy! Do - New Years Parties! Click the link to see what our partners are up to for the holiday. Happy New Year! Six Flags Over Texas Holiday in the Park ends January 5 and is open New Years Day! Come celebrate the remainder of the holidays in the winter wonderland created at Six Flags. We recommend the endless cups of hot chocolate. Get your tickets and check park hours here. Arlington has sports. In turn, sports bars are big in Arlington. Whether you’re into catching a pregame meal or drink special, the city has a plethora of choices (and walls of TVs we might add) where you can root for your team. View our list of fun places to eat and/or watch the game here. Arlington restaurants have had not one, not two or three, but FOUR restaurants featured on Travel and Food Channel. First, there’s Chop House Burgers, where we recommend the titular Chop House Burger –Chef Kenny takes brisket and ground beef and creates the ideal smoky delicious flavor locals and visitors rave on and on about. Next is Taste of Europe, which is a European/Russian Supermarket and Russian restaurant – we recommend the stuffed cabbage and black tea with jam, and if it’s cold the warm beet borscht is AMAZING! The best of Mediterranean-style food, Prince Lebanese Grill, has also been on the show. There, we recommend classic gyro and the pistachio baklava for dessert. Last but not least is Jamaica Gates, jam-packed with exotic flavors from the Caribbean—you can’t go wrong with Chicken or Beef Patties as an appetizer and Oxtail Rice and Peas with Stewed Cabbage, a staff favorite. Since its winter in Texas, it’ll at least be cool enough to warm your belly with the nourishment of some Vietnamese pho beef soup at Sprouts Pho & Spring Roll (less than a mile from AT&T Stadium! ).Man vs. Food visited back in 2011 and took their trademark SUPERBOWL Pho Challenge, which takes a massive bowl of pho and challenges you to eat the entire thing in 30 minutes. Good news –you probably won’t need to eat the rest of the day AND you get a free “Pho Killer” shirt for beating the challenge. Interested in taking some public transportation? If you’re staying in an Arlington hotel for the game, there’s a good chance it’s a Trolley hotel. Not sure? Visit www.arlingtontrolley.com for special route information and contact info. Guests may also pay for Trolley service. Please visit the website hyperlinked above for all Arlington Trolley inquiries. J. Gilligan’s Bar & Grill will also have a game shuttle. At $8 per person to ride, save and time by taking this shuttle to the Goodyear Cotton Bowl.Call the restaurant directly at 817-274-8561 for details. Do - Tour the Ballpark! Catch a tour of the retro-styled Globe Life Park in Arlington, home of the MLB Texas Rangers. With friendly tour staff, affordable tour pricing and it’s incredibly close proximity to AT&T Stadium, you can’t go home without at least touring the press box, big league batting cages, dugout, locker room, field and more. Modern Masters from the Guild Hall Collection at Arlington Museum of Art features works from some of the 20th century’s most prolific artists including pieces by: Andy Warhol, Jackson Pollock, Roy Lichtenstein, Robert Motherwell, Willem de Kooning, Robert Rauschenberg, Jasper Johns and more. Do - Hub and Spoke – See what our area partners are up to! Once you’ve experienced all Arlington has to offer, you’ll realize there’s nowhere else like it. Hit up one of our area partners for a glimpse into the entire DFW Metroplex. Sixth Floor Museum – Who shot JFK? Get a chilling and evocative view into the life, assassination and aftermath of one of America’s most celebrated presidents. Personally, we take my family here every time they visit the area for the first time. Perot Museum—Interested in how the universe works? Do you like interactive exhibits? The Perot Museum is the place for you! Dallas Zoo – View and learn about the conservation of some of our planet’s most captivating species and have some fun along the way. Plus, the Dallas Zoo just welcomed a two-year-old tiger this month.